If you are looking for information on the Rubbish Works franchise business opportunity, Rubbish Works franchises or Rubbish Works franchising, then you have come to the right place. 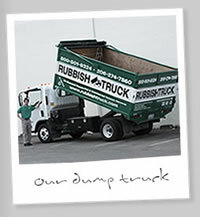 Rubbish Works is a dynamic and rewarding business developed to provide an efficient, on-demand rubbish removal service. Positioned to serve the growing demands of the "do it for me" generation, the Rubbish Works concept is a convenient, cost-effective, no-touch solution for rubbish removal. Becoming a Rubbish Works franchise partner means freedom, flexibility and of course, financial reward. Offering turnkey business models designed to help you achieve your financial goals, Rubbish Works' executive model features a flexible, yet targeted approach to business management. 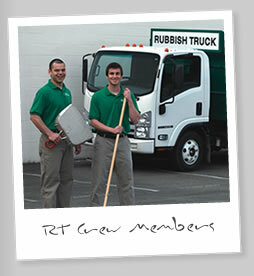 A successful Rubbish Works franchisee carefully manages truck crews and supports ongoing local marketing efforts. Wondering who is going to take all the calls? Our centralized call center handles incoming calls, dispatching new jobs to your truck crews via our advanced web-based scheduling system. Rubbish Works strives to maintain branding that is built around professionalism and service quality. Our brand does not employ a cliché name or unusual design that can oftentimes compromise credibility. Rather, our brand is unique, recognizable and associated with a standard of top-notch service that distinctively resonates with both residential and commercial customers alike. A commitment to recycling represents a key differentiator. Our eco-friendly approach is a cost-effective, highly marketable feature that differentiates Rubbish Works from its competitors in today's increasingly "green" industry landscape. How is it done? Simple sorting techniques make it easy for crews to separate recyclable items from non-recyclables. Our environmentally sound approach to consumers' disposal needs distinguishes Rubbish Works as a responsible and trusted leader in the disposal industry. Rubbish Works provides outstanding training and support for everyone involved. Our Right-Start Training Program begins with you traveling to our home office in Bellevue, WA, where we will work together to educate you on business practices. The primary objective of the Right-Start Training Program is to provide you with the tools and operational procedures to assist you in day-to-day business administration and the development of a comprehensive plan to launch your operation. Right-Start Training Program: Spend five days in our training course and designed to teach you the correct procedures to get your business off the ground successfully. On-going Support and Coaching: A dedicated Regional Service Coordinator (RSC) will work with you to launch your business. Our goal then is to support you for continued growth and success. The key to your success lies in building a strong brand identity within your community. Rubbish Works' relationships with national and regionally-based marketing firms can assist you in developing a strategic approach to launching the Rubbish Works brand within your community. Our professional marketing materials are readily available for targeted distribution within your area. With the help of thoughtfully developed marketing strategies, we can successfully build the Rubbish Works brand around your customer base. Watch our marketing campaigns work for you!